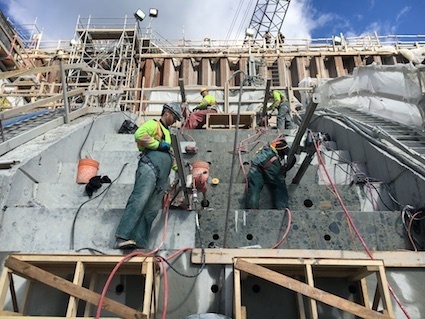 Canadian concrete cutting company Coast Cutting & Coring Ltd. carried a very complicated task when they were taking on the mission renovation of the Ruskin dam to increase its reliability and efficiency, withstand an earthquake and several more tasks. (Source: Concrete Openings Magazine). Located in Mission, British Columbia, the Ruskin Dam is 110m long (360.9ft.) and 59m tall (193.6ft.) concrete gravity type dam. Its 42,000,000m3 reservoir (Hayward Lake) has an ‘ogee-type’ spillway that consists of seven radial gates. Built in the 1930s, the aging dam structure has required upgrades and reinforcement to prevent a critical failure in the event of an earthquake. In addition, equipment in the dam’s powerhouse was obsolete and needed to be replaced. €545M was allocated for a series of upgrades and seismic reinforcement that would help the dam withstand an earthquake, increase its reliability and efficiency, and create a two lane road and pedestrian walkway as well as restoring the heritage façade of the powerhouse building. The project began in 2012, and involved major concrete sawing and drilling works. This consisted of over 9M kg (20M lb) cut and removed above and below water, 5,000 holes cored to depths up to 12m (39.4 ft.), 697m2 (approximately 7,500ft.2) of surface scarified; all completed in phases over a three year period. The concrete sawing and drilling work involved the cutting and removal of four existing piers, the bridge deck and sections of the spillway. Other tasks included cutting free old generators, intakes, gate slots, draft tubes and creating new steps on the spillway for pier forms. In addition, deep hole drilling was specified for the installation of seismic anchoring, and the spillway surface required scarifying for reinstatement. Coast Cutting & Coring Ltd., a division of CSDA member Westcoast Cutting & Coring Group Ltd. based in New Westminster, British Columbia, was initially awarded the work at Ruskin Dam in January 2015, and completed its final tasks almost three years later. There were a number of factors adding to the complexity of the work involved, both from an environmental aspect and in terms of specifications. A large portion of the work was done on the face of the dam spillway, which was on a 600 slope with limited access. In addition, it was specified by Flatiron/Dragados Joint Venture & Voith Hydro, the general contractors for the project, that there be a 25mm (1inch) tolerance for the form work. Also complicating the project was that the reservoir below the work area which contained spawning salmon, so protection of this wildlife and water within the reservoir had to be considered when planning the work. Cutting of the dam structure and powerhouse was done simultaneously, with a total of 30 operators working six days a week in alternating shifts during each phase of the work. Tasks on the dam section started with the slab sawing and removal of the existing concrete bridge deck that was 6m (19.7ft.) wide. Holes were cored through the deck so the steel shafts from the old gates could be cut free, then lengths of concrete railings were braced with knee braces and cut for removal. Deck pieces were slab sawed between the bridge beams with a Husqvarna 4800D, leaving three bridge beams in place. At this point, wire saws were positioned on both sides of the beams to cut them free. The beams were supported then removed one at a time by crane. The intakes at Ruskin Dam had slots cut on both sides measuring approximately 18m (59ft.) tall x 8m (26.2 ft.) wide for gates to be installed. These gates allowed the flow of the intake water to be stopped for any maintenance needed on the generators. The lintel beam and sill beam were cut and then chipped out to save existing reinforcement for structural tie ins. Concrete was cut with Husqvarna hi cycle hand saws, while the chipping was done with a Husqvarna DXR310 demolition robot. The four free standing piers were then cut, three of which were 12m (39.7ft.) square and 2m (6.7ft.) thick, which were divided into 48 pieces each weighing approximately 16,000kg (35,000lb). One of the piers was poured against a rock face and was around one third larger than the others, this being cut into 58 pieces. Scaffold and platforms were set up for access to one side pier and a narrow hanging platform positioned on opposite side to provide access for slurry containment and wire access. The scaffold was set up in 2.5m (8.2ft.) sections as the pieces were cut into roughly 1m (3.3ft.) x 2m (6.6ft.) sections. This way, two rows of blocks could be lifted prior to removing one section of scaffold. Operators cored 50mm (2inch) holes through the piers for wire access, with the wire being pulled vertically in sizes ranging from 2.5m2 (27ft.2) to 26m2 (279.9ft.2). The larger cuts required 46m (151 ft.) of wire supplied by Cyclone Diamond Products. The contractor employed two Hilti DSW 3018 wire saws and manipulated the wire to perform two cuts at the same time, either horizontally or vertically or opposite directions, to increase productivity and schedule. Cut pieces were lifted out by a 275t crane set upon a floating barge located nearby. The final pier removed was the larger structure that was poured against the rock face. Having no access to the backside of the pier, the contractor made a grid pattern of 12m deep (39.4ft.) intersecting core holes with Weka SR68 drills to allow sections to be cut free with a wire saw. As each cut intersected with another, holes had to be cored from front face to intersect and the pier was cut into 58 pieces. This produced 509 holes with operators coring more than 18m (59.1ft.) per man, per shift, totalling 1,551m (5,088ft.) of coring drilling. “We were cutting on multiple piers at the same with an average cutting speed of 3m2 (32.3ft.2) an hour and each saw cut up to 28m2 (301.4ft.2) each day,” said Dario Babic, partner for Coast Cutting & Coring Ltd. The dam had seven existing gates but the project required this number to be reduced to five, so new steps were cut in the 600 sloped dam wall for the installation of new steel formwork. A combination of wall sawing and wire sawing was performed using a Husqvarna WS 482 wall saw, a Pentruder 8-20 wall saw and the company’s Hilti DSW3018 wire saw. Operators started at the top and bottom of the spillway simultaneously because the schedule only allowed 17 days to complete this task. From the top, the steps were cut vertically down by custom blades from Cyclone Diamond Products and were powered by the Pentruder wall saw. Corners were finished by CW630 chain saws from ICS, but also core drilled vertically and horizontally to create wire access holes to finish the end cuts. Working from the bottom required a different strategy because of the depth of the steps. Holes were cored vertically down past the required depth of the step so pulleys could be placed in the 180mm (7.1inch) holes. As the work continued, two more crews began working from the top and bottom of the wall, coring pilot holes vertically and horizontally in order to create openings for dowel installations to anchor the new piers to the bedrock. A further part of the project involved removing 150mm (6inches) off the surface of the spillway and creating a rough surface. Water blasting proved time consuming, so the contractor again used its diamond cutting tools. The 12m2 (39.4ft.2) area was cut into 16 smaller square panels measuring 3m2 (9.8ft.2). As the wall sawing of the panels progressed, a wire saw crew placed diamond wire into the cuts and performed pull cuts to achieve the new surface profile. After each row of four pieces was lifted out, a Husqvarna DXR310 demolition robot fitted with a milling head scarified the surface so that new concrete could be poured onto it. This was a huge job for Coast Cutting & Coring, or any contractor for that matter. To keep up with some additional tasks added to the project, the contractor invited fellow CSDA member Di-Tech International of Winnipeg, Manitoba, to assist and partner on the spillway demolition work. “Di-Tech International assisted us with tooling, crew members and general guidance from the owners. Working with Steve Johnston and Luke Dufalt ensured the job was a great success and created a bond between our two companies,” explained Babic. In addition to the large amount of work completed on the dam spillway, the cutting contractor also had several tasks to complete at the nearby powerhouse. These tasks included the cutting of a 9m (29.5ft.) steel pipe, the dissection of a stator into six pieces, the removal of numerous concrete bases and the creation of 1.5m (5ft.) x 7.5m (24.6ft.) openings between the three levels of the powerhouse to aid in the cooling of the new dam generators. On the reservoir side of the dam, underwater wall sawing techniques were employed to cut slots for the coffer dam. A Husqvarna WS 360 hydraulic wall saw fitted with a 610mm diameter (2ft.) blade made the required cuts. Each slot took seven days to complete with a crew working 12h shifts. To complete the sawing and core drilling tasks safely on the 600 slope of the dam wall, specialised work platforms were erected and all workers were fitted with harnesses with fall arrest equipment. To make sure the salmon living in the dam reservoir remained healthy and unharmed during the work, a three tier slurry containment system was employed. On every scaffold platform a rubber membrane was installed and slurry was pumped into totes. The upgrade and reinforcement work at Ruskin Dam was completed September 2017.